Grant: What event does Demyansk Shield The Frozen Fortress cover? Vance: Demyansk Shield is the story of about 80,000 Germans encircled in the Valday Hills region of Soviet Russia from late January through May 1942. When the German offensive towards Moscow failed in December 1941, Soviet forces immediately counterattacked. This grew into a general offensive and in January it became a strategic offensive over nearly the entirety of the front lines in the Soviet Union. In a series of offensive drives, the Soviets hoped to surround and destroy various groupings of German units and force a prolonged retreat. In the region of the Valday Hills, the Soviets hoped to destroy the bulk of the German 16th Army. Centered around the town of Demyansk, these Germans refused to be pushed over easily. Grant: I understand that there are no other games on this subject. Why do you think there aren’t? What made you want to design a game to cover this conflict? Vance: In the Fall of 2014, Randy Lein of Legion War Games contacted me about doing a game on any East Front topic and he wanted it kept to one game map. At the time he said Legion had no such game to offer the public, nor any in process. I gave him a choice of four game topics where I already had at least some crude beginnings of a prototype. He chose Demyansk. Certainly the “no other games on this subject” aspect appealed to him. With so many other East Front games out there, why has this topic been overlooked? I can identify two factors: it is an infantry subject, and easily available English language research materials are not available. You really need both German and Russian language sources to get into the details that will properly tell the story. Grant: Who is the artist for the map? Did you have trouble finding info on the map? How did you decide on the final look and layout? Vance: The map is perhaps the first thing you build, if only because it sets the boundaries of the game. Randy Lien has done the map graphics. He is a good artist, and he does good chart-work too. While I could make art graphics clear to him the maps I used to build the game were anything but clear to me. I relied on a fairly contemporary Russian 1990s road atlas (which also shows contour lines!) for the basic layout and then modified it to fit the period as best I could. Captured German maps in black and white from archives microfilm were just about impossible to read. However, hills don’t move, rivers don’t move much, and roads only get changes in emphasis. With that straight I had enough that I could make fairly reasonable guesses. Some pre-war villages truly disappeared. Forests completely changed. Do not rely on a contemporary map to do 1940s forest. I chose a scale that would get all onto one map, and that worked great for what is: essentially, a battalion-level game. Grant: You seem to have several games focused on the East Front of WWII. What about this conflict draws you back each time? Vance: The East Front represents absolute war, a fight to the finish. This means your game play should focus on the art of war and the solution of operational challenges. You can also see how massive the East Front is – it’s big, folks. Such a large subject means lots of possible game topics and the ability to show each at different scales. Then finally, the fighting was intense, lots of participants, and added a wide variety of equipment and training. Grant: What are the force structures for the units? What types of units are depicted on counters? Vance: The Germans defended with just one army (and not all of that) against initially four Soviet armies and two strong Guards rifle corps. The Soviets threw huge numbers of men and materiel at the Germans and reinforced liberally. They had to since they lost so many, about 245,500 according to the writings of noted author Col. Glantz. The German player will certainly receive reinforcements but his initial forces must withstand very heavy Soviet attacks and yet cover essentially the same front throughout the campaign. The Germans fought the campaign in battalions and battalion-equivalent groupings. The Soviets fought it as regiments (and rifle brigades). These are the most common representation of unit sizes in the game. Grant: How did you determine the final OoB for the Germans? Vance: A good German OoB presents quite a challenge. Anyone reading in popular history about this campaign will discover right away that only large formations are discussed and when the discussion gets down to tactics it gets into German “Kampfgruppen.” The composition of these kampfgruppen was often a mystery. These practically always carry the name of their commander, so how do you track it when the commander changes? A fellow gamer in Germany provided many of the answers by translating divisional histories. He had most of them and went through these page by page, and also provided the maps found there. The best histories were on the SS Totenkopf and 250th Infantry divisions. These two books answered a lot. The game owes much to his efforts. Overall, I spent a lot of time on OoB work, practically all of it ground breaking for our hobby. A future game by someone else may get it better but that research will have to go to considerable lengths to exceed what you get with this game. Grant: Why did you decide to pass on including the Soviet armored train “Red Dawn” in the game? Vance: Historically, it made a great individual target for German aircraft and artillery. While it added probably nothing in its one battle, I will concede that that battle was poorly planned and very poorly executed. The train disappears from the historical record after this battle and so there is no reason for it in my game. Grant: What are the various scenarios included and how long does each take to play? Vance: There are three scenarios. You may not need all the available turns for each before you reach a conclusion. The campaign scenario will likely require a very long day to play. SCENARIO 1: The Soviet Winter Offensive. There are 8 turns: GTs 1 through 8. This scenario shows the creation of the Pocket. SCENARIO 2: Operation Bruckenschlag. There are 7 turns: GTs 10 through 16. This scenario uses just half the map and concerns only the relief offensive and the breakout from the Pocket. SCENARIO 3: Demyansk Campaign. There are 18 turns: GTs 1 through 18. As its name suggests, this scenario covers the entire campaign. Grant: What is the outlined Sequence of Play? Grant: How is initiative determined? Can you try to improve your chance to gain initiative? How? Vance: With the two-operations per turn system I first thought initiative should be determined each turn. Playtesting showed this to be disastrous to the side on the strategic defensive. If he ever got initiative, he would pass it on to the other player because the potential of a double move could crash the Pocket straight away. By taming it to only two decision points both players would plan for the potential shift and this also fits the timing for Scenario #2. Even so, initiative change is not automatic. Grant: What are the effects of being out of supply? What is the distinction for combat supply? Why was this included on the design? Vance: The game situation seems to cry out for a detailed supply system where you count out tons of ammo and so forth. Nothing could be more tedious and kill the game quicker than this. Besides, I did not really want to fill up even more counter space. From early on I determined the best solution would to be to judge supply at the moment of combat. Everyone is on emergency supply anyway, so if they cannot draw the extra ammo needed to attack or defend, then Out of Supply effects should apply and apply only then. In combat, Out of Supply means a column shift against you. Out of Supply artillery cannot conduct support. For movement, nearly all your units are on foot already, so a little more fuel will not matter. And then many of the Germans in the Pocket have already been docked a movement point – they are starving and eating their animals. Grant: How does weather affect game-play? Is it randomly determined with a die roll? Vance: The Demyansk campaign begins in cold and snow, experiences mud in various thaws, and finally ends in a sunny and warm spring. This much change means weather must be addressed. Do you do it in a predetermined pattern? Or, do you roll the die? Since the seasons are sharply distinct, the best choice here is to merge the two concepts by having players roll the die at the beginning of each Operation and apply a seasonal DRM. This results in a seasonal pattern with variability from the die roll. Grant: Are there unit stacking limits? How is this governed? Vance: You count stacking points, typical of so many of my games. The seven-point maximum generally means three German battalions, or three Soviet regiments. This may appear to be inconsistent but stacking is really a function of command and control for games of 20th Century warfare. The Germans do have some regiments where stacking is more efficient. While the Soviets have a few division-size units, these really show a tremendous inefficiency of effort. Soviet small unit tactics were very near non-existent. The officer cadre who knew anything had largely been wiped out in the summer fighting. Grant: How do reinforcements come into play? Are they scripted or is there player judgment about what to bring in? What happens if a player delays its reinforcements? What strategic advantage does delaying offer? Vance: Both sides receive a lot of reinforcements. The Germans historically built up as fast as they could. They then used their reinforcements first to stabilize the front line and then to build up for an offensive. The Soviets use theirs first to feed the initial offensive and then later to build up for a renewed offensive should the Germans still be holding on. All units arrive according to a fixed schedule. While I doubt either side would want to delay arrivals, they might do some short delays in order to mislead the other side. There is some play for the Soviet as to the exact entry hex; each of his three groups of units has a range of entry locations; so game play here can keep the Germans guessing. There is also the withdrawal of the 2nd Guards Rifle Corps (six units). The Soviet player must march them off the south edge at a particular location within a certain time frame; he has only a small amount of leeway on this. Both players also have replacements. Some play on exact entry locations for rebuilt units can also create play variation. And to a limited extent, German replacements can be flown into the Pocket (must be to to an airfield). Within these variations there is most definitely a certain tension about allocation of resources. You must think ahead. Grant: What is the purpose of the Exploitation Movement Phase and why was this included? Vance: Exploitation helps emphasize the advantage of combat. Theoretically, when you commit to combat, that means you are committing to action and an attempt to gain (or maintain) initiative. Exploitation provides the initiative-like follow through from combat that certain units can perform. Ski units, armor, and certain other units (all specially marked) have this ability. This campaign is really an infantry fight but the exploitation mechanic restores extra movement and rewards planning. Particularly, it provides ski units an opportunity to fan out in an enemy rear area. Grant: How does Air Transport work? How does this give the Axis player an advantage? Vance: The Germans moved just enough into the Pocket to keep it going. And it was a major effort to get just that. Historically, the Germans misjudged the success of their air relief effort thinking they could apply it in larger situations, such as Stalingrad. The air effort here does not begin until GT5 but at least the mechanics are simple. Just pick up an eligible unit from the off-map box and then place it on the Demyansk airfield. Eligible types are limited and size is limited, but it is a good way to get replacement points into the Pocket and thereby keep some units at full strength so you build up for the breakout. Grant: The Soviet player counters with Air Drop. How does this work and what advantage does this give the Soviet player? Vance: The Soviets were very limited on this. They had a whole airborne corps to use but had few transport aircraft and these would have to dodge the Luftwaffe on the way in. Basically, they would have to sneak in and this means only one unit is actually able to make the jump. Other than this, they can drop anywhere they want! Just pick up the unit from an off map box and place it. It gets one jump; that is all. The rest of the airborne corps will march to battle. Grant: How does movement work? How do Zones of Control affect movement? Vance: Movement is the traditional march, hex by hex across a regular hex grid. On the way the unit will encounter a lot of forest and swamp. It will have to cross rivers and near the end of its journey it may have to climb hills. You will have a nice-looking Terrain Effects Chart to give you the particulars. Along the way you might visit a few towns and villages. The Demyansk area is not well populated and this means a poor road communications network. If the unit bumps into an enemy Zone of Control, it stops for that movement phase; it is not required to attack. Grant: How does Infiltration Movement work and how should it be used? Vance: Your intrepid combat unit just stopped at the end of the last movement phase in an enemy ZOC but your unit has lots of energy in its high movement allowance. Certain units that have sufficient MA can move one hex through an enemy ZOC when starting their movement phase in an enemy ZOC. It then stops (because it has moved into another enemy-controlled hex) but that might be just enough to open up the enemy front line. If he can’t counter it, you’ve got him. This can become a fruitful strategy for ski units. Grant: How are Air units used and what role do they play? Do both sides have Air units? What is the focus of Attack and Bomber units? How are Artillery units used? How many does each side have and can they be saved over from round to round? Vance: I am combining your questions here since air and artillery are closely linked. Both function as support units. Both players can add support to the same single combat, air units as desired and available and artillery that is within range, although bombers are limited to targets they can see, such as towns. Ground attack air units (Stukas) and artillery can hit anything. It all arrives. Players then compare support values from a chart to determine odds shifts, one or two columns, either way, and your shifts may cancel your opponent’s shifts. The attacker then applies the net shift and goes to the appropriate column on the CRT to obtain a result. I got rid of almost all DRMs in this game. Some combat results will include an asterisk. If this occurs for your side you choose either all your artillery support to be Fired (no longer available this turn) or all your air support to be Flown (no longer available this turn). If the asterisk does not occur those same support units will be available for the next combat. In effect, a little one-point pop gun might get to hammer away all turn; or if bad luck occurs, it might be turned to Fired right away. Grant: The Combat Results Table (CRT) is odds based. Why do you believe this is the best way to determine the outcome of combat? Is there something new about the combat system? What special combat situations are there? Vance: It is interesting that you call odds-based CRTs into question. The hobby has certainly tried various sorts of CRTs and in design you employ different type of CRTs for different situations. Most combat in this game is based on infantry action. Infantry actions take a while to develop and, fortunately, the time scale here allows sufficient time for the battle to come to a resolution. Differential CRTs are appropriate for more tactical time frames. Operational infantry action is pushed along by having the odds in your favor. So, the combination of needed odds and sufficient time allows an odds-based CRT. Grant: What Retreat options are available? Vance: Since infantry action is not fast enough on the ground to remove defender options, I get to introduce some game options to allow a player some control over the intensity of the battle. A player can attempt No Retreat if his force is on a strongpoint or certain other terrain and he may pay an extra step to hold the hex. If he does not want to stand, then he retreats either one or two hexes, at his option. If that retreat will carry him through an enemy ZOC there is a special Retreat Through Enemy ZOC rule to handle it. He may not make it through, but if he is capable of exploitation movement or if Storm (most storms are likely snow storms) is going on, he has a better chance. Those exploitation-capable units even have a chance to avoid combat altogether, but only if they pass a die roll (you can’t make this automatic and have a good game). Grant: What are strongpoints and how do they affect Supply? How do players construct them? How are pontoon counters used? How are airfields constructed and what is their use? Vance: Yes, you can build an airfield, and in the snow in the dead of winter! The Germans actually built one, albeit rather small. Mostly, you just declare it as being done. Just be careful about where you do it because you will not have another opportunity. And, if you build it on a swamp, it disappears in the great thaw. Historically also, the Germans built fortifications, lots of them. Originally, I included special construction units (for the strongpoints and airfield) but really, all infantry could dig just the same. We don’t want a situation where suddenly strongpoints pop up all over the map and then do so just about every turn. In effect the Soviets would then be fighting fortifications at every turn. That is too much. The best bet was to provide a limited number (testing indicated three to be the best number) each turn to be started. They can be built in any supplied position and do not need a unit to build them. You just assume the necessary personnel are provided (which could, historically, include POWs). Now the German is saddled with yet another planning decision. The Soviets cannot build any of these. They are on the offensive and to dig-in would be defeatist. Grant: Explain the differences between Tried and Untried units? Why did you include this in the design? Vance: The Untried unit concept adds uncertainty and makes players think differently about their decision making. 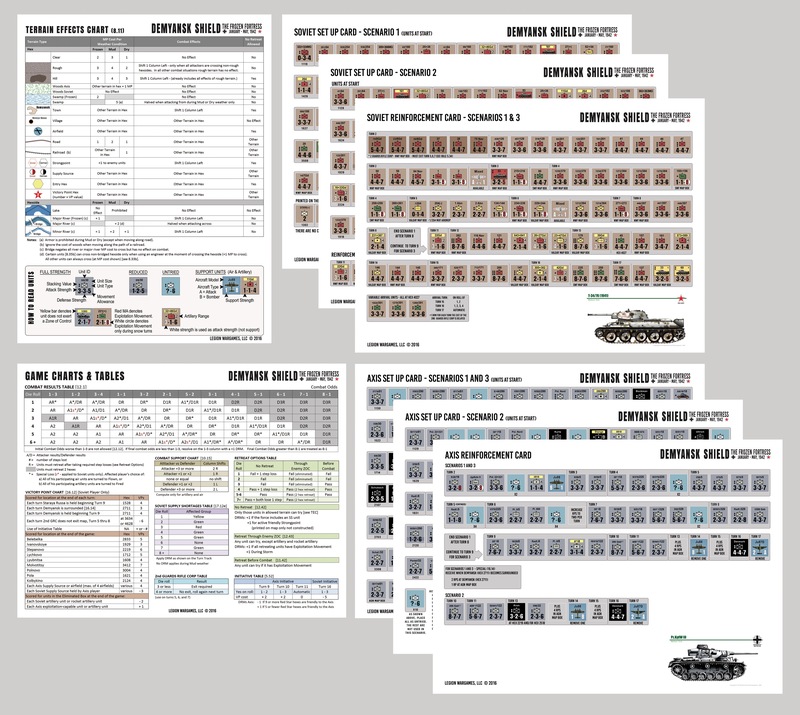 The only units this applies to are the units of the Luftwaffe field regiments. These are the first ones of this kind fielded during the war and they certainly had uneven performance. On average they were not very good, but neither side knew that with certainty at the outset of the campaign. Players will see a unit with an Untried side where its values are unknown. Only in combat are their values revealed – by turning the unit over to its Tried side. Once Tried, it remains Tried. All other German units have already been tested in combat. I did not do this for Soviet units because they were already penalized in strength and tactically they were going to be handled differently anyway. I needed those units to have the required number of steps that I calculated as needed for the overall campaign. Grant: I noticed there are some specialized units including Rocket Artillery, Ski Infantry and Parachute Infantry. How does each of the special units work and what specific advantages do they convey? Vance: Specialized units can raise player interest and raise the stakes in proper game-play to get the most out of these units. Rocket artillery automatically turns to Fired once it is used. Ski infantry have a larger movement allowance; after all, they just zip through the snow. They might retreat before defending in combat and this means they can screen some sectors and simultaneously threaten an unguarded enemy rear. Grant: Tell us about the special Axis v.Borries unit. Vance: This unit is a battalion led by Lt. Col. Herman von Borries, a historical figure that you can read up on in at least a couple (English language) histories. He led the very successful breakout from the Pocket that led to a permanent link with outside forces. Yes, I am related to him but only back through some five generations or so. 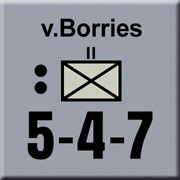 Since this is the only von Borries to have led a combat unit of this size (or larger) during the entire war, in any army, you bet I am going to include him. This is my only opportunity for all of WWII gaming to do this, and it is fully justified! Vance: It varies somewhat. Early on, if the Soviet player captures either town: Starya Russa or Demyansk, he wins outright. If he needs more time, and he likely will, then he has got to do it by scoring enough victory points (mostly on locations held). The German is absolutely on the strategic defense so he need only avoid Soviet victory conditions. Since Soviet units are adjacent to Starya Russa from the very first turn, it looks like an easy victory condition, but maybe not. The German is fortified and has just enough of a garrison, but only if he can maintain it. Historically, it withstood all attacks. Grant: What is the story of the little Siege of Kholm and what role does it play in the game? Vance: I toyed around with the idea of including Kholm. Then I later considered presenting Kholm as a stand-alone battle on a map (about 8×11 inches) small enough that it could appear in a magazine. Kholm is a tiny place. The problem either way is that it changes overall victory conditions radically. What if the Soviets just plain blow out Kholm? Any wargamer worth the dice handed to him would just plain march his units north and tip the balance there. In short, the game swings way out of control. I had to consider that the game is really about Demyansk, not Kholm. Grant: What is the current production schedule for the game? Vance: I am not sure about the actual printing schedule but I can say that practically all the proofreading has been done. We may be waiting on Randy to gang-print it with another game. Rumor has it that the completed game should appear in a bit under two months. The game is still available at it’s Customer Pre-Order (CPO) price of $44.00. Good interview…..I’ve enjoyed several of Vance’s other games …. do I really need another WW2 EF game? Now leaning toward getting this one….. I hear you on another EF game. But this one appears to be quite a bit different with some of the special units (ski) and the interesting use of air supply. Also looks fairly simple as far as rules go. I’m looking forward to it. Thanks for reading!